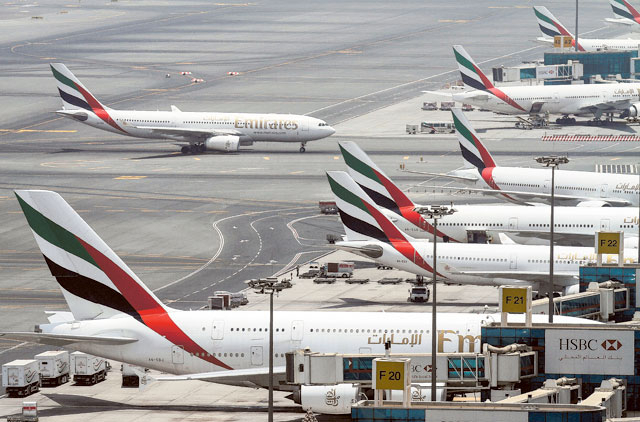 Dubai: Emirates reported a 15 per cent jump in passengers for the first half of the 2013-14 financial year having flown 21.5 million passengers over the April to September period. “Our capacity and route growth continue to match and meet passenger demand,” Shaikh Ahmad Bin Saeed Al Maktoum, Chairman and Chief Executive, Emirates Airline and Group, stated in a press release. Details of the airline’s passenger numbers emerged in the aviation group’s half-year results announcement released on Tuesday. Emirates report their annual financial activities from April 1 to March 31. The increase in passenger numbers is a positive indication for the airline as the aviation industry continues to face regional and global challenges including high oil prices and volatile markets. John Strickland, Director of UK-based aviation advisory JLS Consulting said via email that market variables had undoubtedly had an impact on the performance of the airline over the first half of the financial year. “Higher fuel prices and challenging market conditions has had some impact on revenues which have not grown in line with traffic,” he stated. Revenue at the airline is up two per cent to Dh1.7 billion over April to September compared to the same period last year. The acquisition of more efficient aircraft has enabled Emirates to strategically expand its global presence. The airline has added routes to five destinations in Japan, Sweden, Philippines, Guinea, and Pakistan since April 1 and the airline is set to launch routes to destinations in Afghanistan, Ukraine, Taiwan, and the United States by end of the fiscal year. “Emirates has [sic] continued to expand its fleet and add capacity and new routes to exploit new market opportunities. Its highly efficient fleet of Airbus A380’s and Boeing 777’s allow it to do this effectively,” Strickland stated. With Emirates receiving 10 new wide body aircraft, increasing capacity by 16 per cent over the first six months of the fiscal year, the airline had a load factor of 79.2 per cent, which is slightly down on last years 79.7 per cent figure. While the aircraft load factor is slightly weaker it was only marginally in the context of the airline’s growth, Strickland stated. Emirates received six A380s, three 777s, and one 777 freighter since April 1. A further 15 aircraft are set to be delivered before the end of the financial year in March next year. The region’s biggest airline by fleet is expected to get even bigger next week with Emirates reportedly preparing for an “enormous” Boeing 777X order at the Dubai Air show to be hosted from November 17 to 21 at Dubai World Central. Regionally and globally, Emirates continue to compete with Etihad Airways and Qatar Airways as each of the airlines increase market dominance from their respective hubs in Dubai, Abu Dhabi, and Qatar. But the emergence of Turkish Airlines will not necessarily put a dent into Emirates future plans. Strickland said that some of the legacy airlines would continue to be impacted by the growth of Emirates and other regional carriers including Turkish Airlines. “It not so much the effect that Turkish [Airlines] will have on Gulf carriers as the effect they are all having on European legacy carriers.